A movement for a new age: the automatic CFB A1000 caliber from Carl F. Bucherer. The watchmakers at Carl F. Bucherer worked on it for three years and the result of their labors is a watch movement of a rare perfection. The CFB A1000 caliber is the expression of a philosophy that will define a new age in watchmaking. With trailblazing developments like the peripheral rotor. With innovative technologies, like the dynamic shock absorption system, registered for patent. And not least of all, with the aspiration to create everything new, from the bottom up. As you would expect from a genuine Manufacture: a watchmaking company that makes its own movements, in its own workshop, from start to finish. A new age dawns: Carl F. Bucherer is a Manufacture brand. In 2008, Carl F. Bucherer opens up a new chapter in the history of watchmaking. Since this year, the company designs and manufactures movements in its own ateliers. To achieve this, Carl F. Bucherer acquired a well-known workshop specializing in watchmaking complications in the Jura region of French-speaking Switzerland. Following on from an extremely successful period of cooperation with Techniques Horlogères Appliquées SA (THA) in Sainte-Croix going back some ten years, the move was an obvious one. The company was fully integrated into the operations of Bucherer Montres S.A. and is now known as Carl F. Bucherer Technologies SA (CFBT). This step enables Thomas Morf, CEO of Carl F. Bucherer, to pursue a twin-track strategy: “On the one hand, we will continue using tried-and-tested basic calibers, including those that were jointly developed. On the other, we will be able to round off our product portfolio with our own calibers and complications.” This means that CFBT will have several different roles to play: that of think tank, as well as a research, development and production center. At present, the company has approx. 20 employees, but that number is set to rise successively in the years ahead. CFB A1000: presenting a new watch movement. Since 2005, Carl F. Bucherer has been working on an unusual self-winding caliber of its own design. It is called the CFB A1000 and was unveiled at the fair Baselworld 2008. One of the unwritten laws of the Swiss watchmaking industry is that only brands that make at least one movement entirely of their own in-house may use the prestigious name Manufacture. At Carl F. Bucherer this is the case since 2008. The CFB A1000 goes back to the basic decision to add a new facet to the multifarious Carl F. Bucherer watch collection that would demand the highest level of technical expertise and craftsmanship. The CFB A1000 automatic caliber fulfils all these requirements without exception. Apart from this, the technicians and watchmakers at Carl F. Bucherer have added a whole string of unusual and unconventional features. 1. To mount it centrally, which means that the rotor then moves over the entire surface of the movement. This design, which has proven itself time and time again, has the disadvantage that it always partially obscures the view of the movement. It also makes it more difficult to fit additional functions on the rotor side. 2. To mount it eccentrically, above the movement. Here we face the same problems as with the central rotor. 3. To integrate a micro-rotor into the movement itself. This system conceals nothing but because of its design calls for smaller components. In order to achieve sufficient winding output with a micro-rotor, the rotor itself needs to be very heavy. However, this leads to greater wear and increased vulnerability to shock. 4. To have the rotor revolving around the edge of the movement. – which has been registered for patent – has an efficient shock-absorption system. The rotor bearing is built to withstand even the most exacting conditions by means of DLC-coated rollers, which are themselves mounted on ball bearings. The latter, which are made of ceramic, make the system virtually maintenance-free. The abbreviation DLC stands for diamond-like carbon, which is an extremely hard and resistant carbon coating. This process has been reliably used in the manufacture of surgical instruments for some time now. DLC is considerably harder and more resilient than more commonly found PVD coatings, and adheres particularly well to stainless steel. The thickness of the coating, which can be applied at a maximum of 250 °C, is around one thousandth of a millimeter. Its hardness is 2000 Vickers, so several times harder than that of steel. Dynamic Shock Absorption (DSA) protects the rotor against impacts. In the CFB A1000 caliber, the ball bearing / roller assemblies are mounted on rocking bars, which are precisely positioned by springs. The setting of these rocking bars takes place through a cam. The new dynamic shock absorption system (DSA) is highly efficient. A transmission wheel transfers the rotor’s kinetic energy to the winding mechanism. Carl F. Bucherer has equipped this transmission wheel with two Incabloc shock-absorption systems to ensure that its axis does not snap in the event of a sharp impact, but contact with the rotor is always guaranteed. In such a case – by no means unusual for a ristwatch – the walls of the bridge limit the radial displacement of the rotor. Any axial play of the rotor is held in check by special screws. Which prevents the rotor from banging against the bottom of the case. Another of the new automatic movement’s outstanding features is the efficiency of the self-winding mechanism. The rotor supplies energy when turning in either direction. The rotor’s movements are polarized by a low-loss winding system. It consists of two clutch wheels with eccentrically mounted clamp rollers. The pair of wheels spring into action reciprocally and are not only simple in design but also very reliable. Central Dual Adjusting System (CDAS) for intelligent precision adjustment. – The balance and escapement require adjustment only once. The system is subsequently secured in position to protect it against shocks. – To guarantee the system’s long-term quality, precision adjustment can only be carried out using a special key issued exclusively to authorized service centers. The balance and stem are bearing-mounted at both ends by two identical Incabloc shock absorption systems, which permits optimum setting of the end shake. A modern interpretation of tradition. The design and decoration of the 30-millimeter wide and 4.3-millimeter high movement are an expression both of the high-quality technology and the brand philosophy of Carl F. Bucherer. The bridges and bars situated at various levels are exquisitely finished, featuring matt and brushed surfaces with diamond-cut facets. Alternating matt, brushed and polished surfaces ensure the high optical quality of many of the other components. But the main function of any watch movement is to measure and display the time. The CFB A1000 caliber shows the hours and minutes on centrally positioned hands. For the seconds, there is a small hand at 6 o’clock. 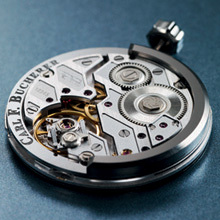 Needless to say, Carl F. Bucherer will be adding a number of useful functions to the basic movement. These may include a large date, a day display or even a power reserve indicator. Mechanical automatic movement wound by a bidirectional rotor running around its edge.